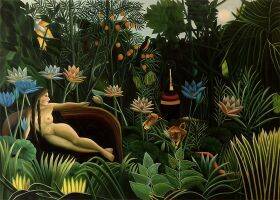 Henri Rousseau was a post-impressionist painter from France. 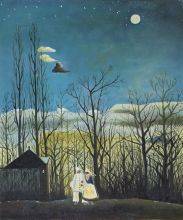 He used a variety of elements in each painting from magazines, photographs, and other paintings. He established a career as a tax collector and consequently, didn't begin his painting career until he was in his forties. 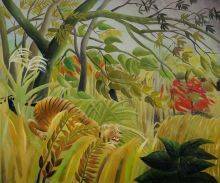 Rousseau was never professionally taught and was considered to be a primitive or naive painter. Many of Rousseau's paintings depict jungle scenes even though he never actually left France. A self-taught French painter who inspired the Paris avant garde in the late 19th century, Henri Rousseau's portraits and landscapes are available as reproductions from overstockArt. These post-impressionist works, which frequently convey an unsophisticated innocence, have all their original vivid colors, ambiguous spaces non-realistic scale and dramatic intensity faithfully reproduced in hand-painted detail on canvas and can be customized with a frame of your choice. 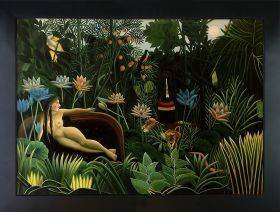 Some of the available dreamlike works of Rousseau available at overstockArt include The Sleeping Gypsy, A Carnival Evening, Woman Walking in an Exotic Forest, Surprise, The Dream, Bankes of The Oise, Snake Charmer and Eclaireurs Attaques par un Tigre. 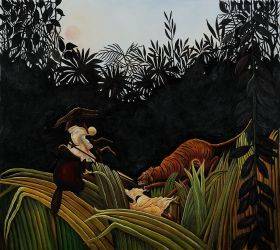 Many of Rousseau's works incorporated details inspired by paintings he had viewed at museums or images he had seen in books and magazines. 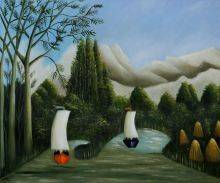 Now his works can be yours, and at a fraction of what you'd pay at a gallery, when you order from overstockArt.